and thinking about these, as I write an erotica scene today… let’s hope it flows like silk today… <3! So what I did is post today to the list where I write with other erotica writers — I called it Bustier, it’s a bit of a standalone I think, just a scene in a sense so it will be interesting to see the crits, anyway so here is an excerpt it came in at about 1428 I think today so under but I was ahead the last three days, so okay, trying to pick a part that is not too too steamy for here? Let me see… Am at 7005 total words now…yay! xxoo! Tulle under taffeta. That’s what I’d wear for him. He’d like the rustle and the swish and the crackle as he parted the fabric. The mountains are washed purple across the city. Darkly blue, under storm clouds. The tiny raindrops in the fresh white sky, the birds skittering for fallen seeds. When we were first married he bought me kitten heels. I was mad for them. He bought me Thierry, gelled ones, with wings like hermes at my ankles. I always wore them with my jumpsuits. There wasn’t time for taffeta. There was always the next thing to be accomplished. There wasn’t time to lounge in laps. The days of the oranges ended, the kimonos ended. It became tea and toast and endless pairs of slippers. There was a pair of sturdy leather boots for climbing. For dashing over rocks in streams, for walking up mountainsides where the pines whispered in the summit’s fresh air, little drifts of snow in flurries around us. The stillness, the quiet and the cold. After a while something of me had gone. It had been orchestrated out. There was long underwear with a waffle pattern, there were drives into the country but not in the little roadster where I wanted his hand on my thigh. I was wearing pants. Some men are skilled at those too. They come off as easily as dresses do. Maybe we all have to learn how to go on after tragic things. I’ll close the lid on the trunk. I don’t want to see the stockings unless he’s with me, peeling them off. I don’t want to wear the bustier unless it’s for him alone. I bought it red under black lace knowing he’d go crazy for the cups and the little garters. We’d be in the theatre and secretly his hand would find the flesh of my upper thigh. He’d slide his hand down inside the silk of the stocking while we watched the film unreel in black and white, maybe something noir, something with a dame in it. He’d keep stroking and stroking until I wanted to squirm but I knew I had to hold still. My kitten heel would dangle from my crossed leg and because it was backless it would fall softly to the floor. I’d move my foot to his trousers, find the cuff and slide it aside, making contact. I’d feel him shift slightly in his seat, never taking his eyes from the screen. His ankle would be warm, the leather of his shoes shiny and black. (that is as far as I can go, it gets very steamysville after this)… ❤ ps: first draft too, so not edited yet! Posted in literary erotica, literary fiction, writing. 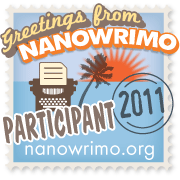 Tagged Dreamstime, literary erotica, Nanowrimo 2011, writing. Next: Next post: Nanoday5 — “Dreamstime” — have 7005, meet-up! stickers! xxoo!